The brilliant and eccentric Szilard didn't like to get his hands dirty doing experiments. He had, however, an original mind, a flair for invention, and a genius for getting industry to provide materials -- although Hilberry was in charge of actual procurement. Massive amounts of graphite and uranium were needed. There was only one significant source of uranium in North America and only one supplier of large quantities of graphite, a dirty and slippery form of carbon. Frank Spedding, by then at Iowa State University, produced two tons of pure uranium; additional uranium was delivered by Westinghouse Electric. Goodyear Tire constructed a square balloon in which to encase the final pile. Work on the final experimental pile—the 31st—began on November 16, 1942. It was a prodigious effort. Physicists and staffers, working around the clock, built a lattice of 57 layers of uranium metal and uranium oxide embedded in graphite blocks. A wooden structure supported the graphite pile. Fermi was reading "Winnie the Pooh" to improve his English so the instruments were given names of characters in the Pooh stories—Tigger, Piglet, Kanga and Roo. A Fermi protégé, Leona Woods—the only woman on the project—took careful measurements as the pile grew. Fermi, stripped to the waist, was black and glistening; Hilberry said he could have played Othello. December 2, 1942, the day wartime gas rationing began, was bitterly cold. The pile was ready for testing. It contained 22,000 uranium slugs and had consumed 380 tons of graphite, 40 tons of uranium oxide, six tons of uranium metal. It cost an estimated $2.7 million. 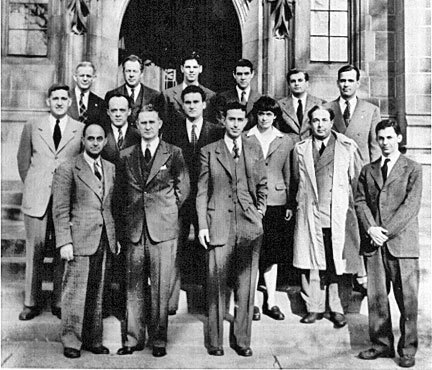 The experiment began at 9:45 a.m. 49 people were in attendance: Fermi, Compton, Szilard, Zinn, Hilberry, Woods; the young carpenter who built the graphite blocks and cadmium rods; members of the laboratory's health and protection unit; students and other scientists. Just before noon, Fermi declared he was hungry and called time out for lunch. All minds were on the experiment, but no one discussed it. At 2 p.m., Fermi's team was back at the court. The three-man "suicide squad"—part of the automatic safety control system—stood by to douse the reactor if anything went wrong. There was a main control. And there was ZIP, a weighted safety rod devised by Zinn; it would automatically trip if neutron intensity became too high. There was an emergency ZIP, tied to the balcony rail, which Zinn operated by hand. And there was SCRAM—the safety control rod ax-man. That was Hilberry. He stood ready, ax in hand, to cut the rope. "I felt silly as hell," he later recalled. "This was a lot of nonsense. We all knew the scientific work would be all right." 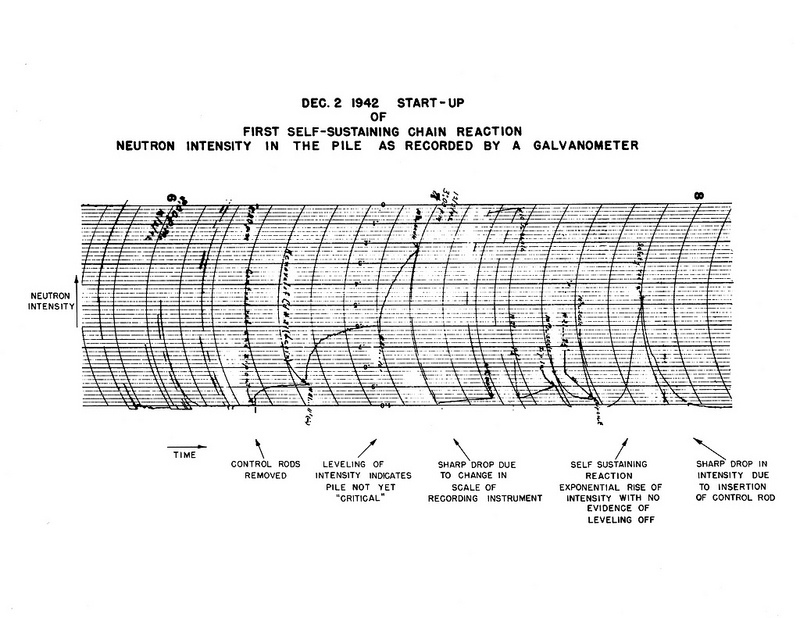 At 3:53 p.m., a self-sustaining nuclear chain reaction was achieved for the first time ever. It had taken 28 minutes. Reactors Designed by Argonne National Laboratory: Early Exploration - Early exploration nuclear reactors designed by the Manhattan Project's Metallurgical Laboratory, the direct predecessor to Argonne National Laboratory, began the development of nuclear technology. From Met Lab to Argonne: Those early days as we remember them - A series of recollections by former staff members who had worked at the Metallurgical Lab and participated in the birth of Argonne. Argonne nuclear pioneers: Chicago Pile 1 on YouTube (by Argonne National Laboratory) On December 2, 1942, 49 scientists, led by Enrico Fermi, made history when Chicago Pile 1 (CP-1) went critical and produced the world's first self-sustaining, controlled nuclear chain reaction. Seventy years later, two of the last surviving CP-1 pioneers, Harold Agnew and Warren Nyer, recall that historic day.